The entertainment discovery engine Jinni is launching its first set-top box as part of its ongoing partnership with the Belgian telecommunications operator Belgacom, the Israeli startup announced today. In addition to these passive content discovery options, users can also make advanced searches in Belgacom’s catalogue, which is powered by Jinni’s Entertainment Genome and friendlier to natural language phrasing. Since a home TV is more often than not a shared device, Jinni’s box also lets users create individual profiles, to make sure suggestions are adapted to their personal taste, rather than to their kids’. It’s also worth noting that the system is opt-in based. Jinni then uses these preferences to suggest content that is similar to a user’s favorite show – in that example, “SpongeBob,” which generates recommendations for other animation series. While this UI is new, the partnership between Belgacom and Jinni started in September 2010, and took a step up when the Belgian operator took part in the startup’s second round of funding in early 2011. 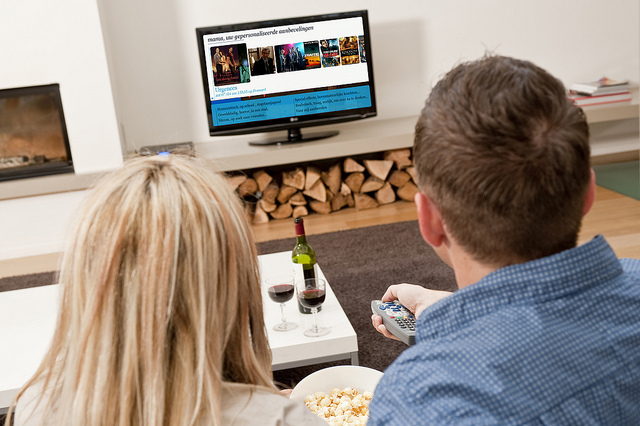 Since then, Belgacom has been using Jinni’s engine for its online service, as well as for its mobile and connected TV apps, a product range which the new set-top box is now completing. It’s worth reminding that Belgacom is only one of the high-profile partners Jinni has attracted since its public beta launch in 2009. As we reported last September, the startup also closed a deal with Microsoft, which means it wouldn’t be very surprising for the Xbox and Windows 8 to use its content discovery engine.